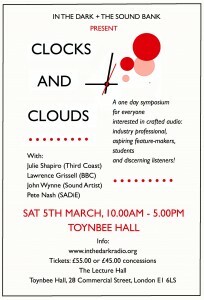 5th March 2011, Clocks and Clouds – An All Day In The Dark Event! 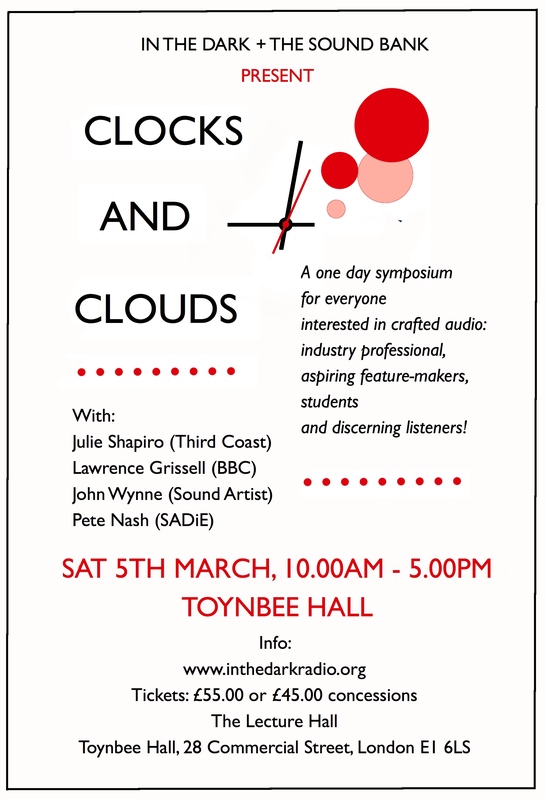 On 5th March In The Dark will be holding its first all-day event, the alternative audio conference for feature-lovers: Clocks and Clouds. There will be talks, listenings, masterclasses and plenty of opportunities to meet and hang out with other producers and listeners. For everyone interested in crafted audio: industry professionals, aspiring feature-makers, students and discerning listeners! All the money raised from ticket sales will be going towards the next round of the Sound Bank grant scheme. 1300 Lunch (included in the ticket price) A chance to chat with guests and delegates over a bite to eat. 1345 Peter Nash (Monty Funk, SADiE) Peter will deconstruct one of his acclaimed documentary-drama mixes to reveal how raw tape can be turned into audio gold.